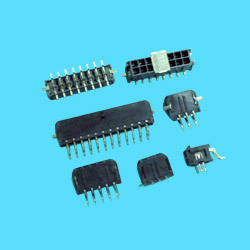 Manufacturer of Electronic Cponents & Parts, Electrical Connection. 2. Material: insulator: high temp LCP UL94V-0 black. 4. Mates with CH3025 series housing. Specification: 1. Current rating: 5A AC, DC. 2. Voltage rating: 250V AC, DC. 3. Temperature range: -40℃~+105℃. 4. Insulation resistance: 1,000MOhms min. 5. Withstand voltage: 1500V AC/minute.